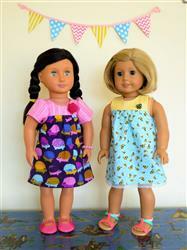 Your 18 inch dolls are ready for the beach, the playground, a picnic, or a garden party in these adorable mix and match outfits. 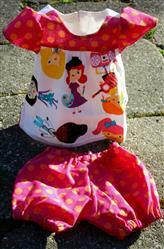 The top can be made in 3 lengths (top, tunic or dress) with or without short sleeves. 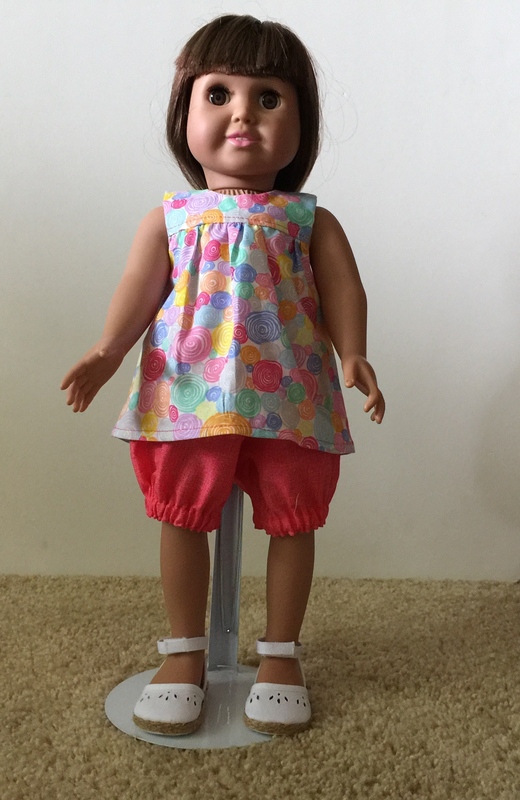 Add a cute pair of bloomers, also in 3 lengths (shortie, knee length or capri length) for a closet of mix and match playclothes to take your dolls from springtime fun to the summer heat. 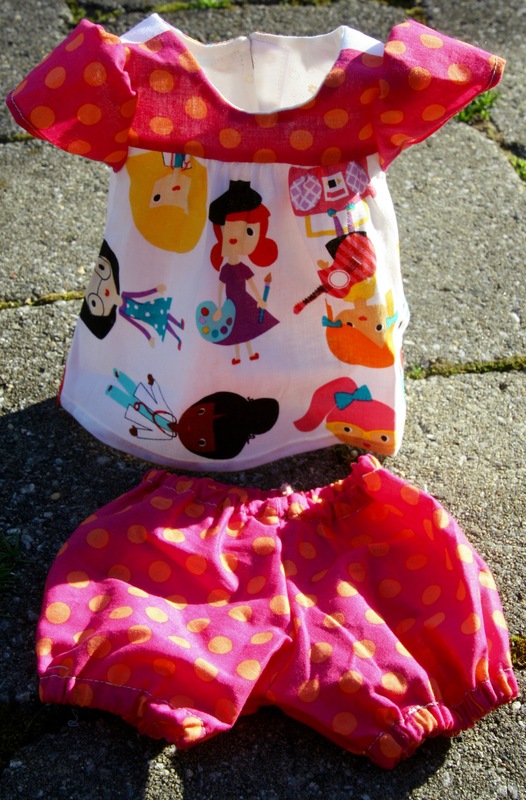 You can also use this pattern to make cute pajamas. Quick and easy to sew, use fun fabrics, trims or add appliqué, embroidery, or heat transfer vinyl to create your own special doll clothes. 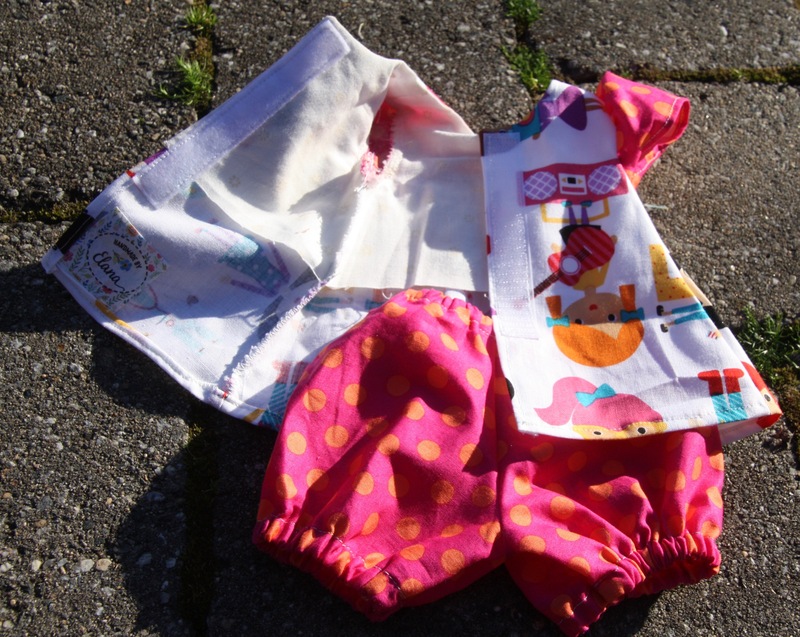 Bloomers Buddies are perfect for every day, or try fun holiday fabrics and make cute outfits for Valentine's Day, St Patrick's Day, Easter, and Fourth of July. 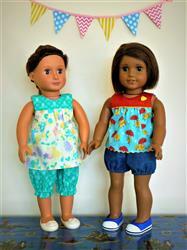 The sky is the limit when you design your own Bloomer Buddies play outfits for your dolls. This pattern is available in three great sizes: 18" dolls such as American Girl®, 14.5" dolls such as WellieWishers™ and 16" Disney Animators' dolls. The directions and accompanying colored photos were very clear, easy to follow. Initially the sleeveless top was made. 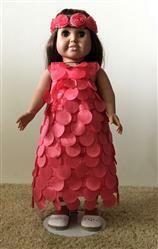 Then the dress with additional length was used for the Hawaiian dress with the polyester overlay. Very pleased how both outfits turned out. The pattern was easy, directions simple and exact. The outfit has variations which allow the one pattern to be made over again with a different outcome. I will be making this again. This is a very detailed and easy pattern to follow. I love the finish and now need to try it again soon. I have no complaints at all. The pattern was as easy as anything and the photos helped a great deal too. An easy go to pattern. Have made several and will be making more for the spring craft show. Easy Peasy! Fabulous pattern. Clear, concise instructions from start to finish.